While proper identification of minerals can take a lifetime to perfect, one doesn't need expensive equipment or expert-level knowledge to begin – simply a few low-cost specimens, and some common household items. The real key to mineral identification is a keen eye, and attention to detail. With just these two tools, even the novice collector can make some serious headway – and learn more about the qualities which differentiate one specimen from the next. Color is a result of the way a mineral absorbs or reflects light. Though it can be a reliable indicator in opaque minerals, color can vary greatly in vitreous specimens, which may hold trace impurities which affect the absorption or refraction of light. Some species (such as quartz) are commonly found in several varieties, which differentiate in color, despite having identical chemical composition – while some specimens which appear identical in color may have entirely different chemical composition. When examining gemstones, a spectroscope can be used to determine which wavelengths of light are absorbed, revealing important information which can be useful in identification. It can also be helpful when determining whether a gem is natural, or synthetic. Luster is the description of a specimen's reflective appearance. Common terms used to describe luster include adamantine (ex – diamond), vitreous (quartz), resinous (opal, or amber), pearly, or metallic. Depending on the quality of light reflected, a mineral may also be described as splendent (glassy), shiny, or dull. Testing a specimen's streak requires only the use of a streak plate – an unglazed porcelain tile, against which the specimen is rubbed, to determine the color of mineral powder which is left behind. A mineral's streak will remain consistent, despite any differences in observable color. To determine a specimen's transparency, simply place an object behind it. If the object's outline can be clearly observed through your specimen, then it is transparent. If the object cannot be seen through your specimen, try using a flashlight to shine light through your specimen – if the light is transmitted to the other side, then your specimen is translucent. If the light is not transmitted, your specimen is opaque. By striking your specimen, and observing the manner in which it splits, you'll determine its cleavage, or tendency to break in a particular direction. Cleavage is defined by the pattern of a specimen's atomic lattice, with breaks occurring parallel to planes of growth. This can help you identify a mineral's structural habit, and provide insight into its composition. Noticing the ease of cleavage, and the number and orientation of breaks, will provide further insight. 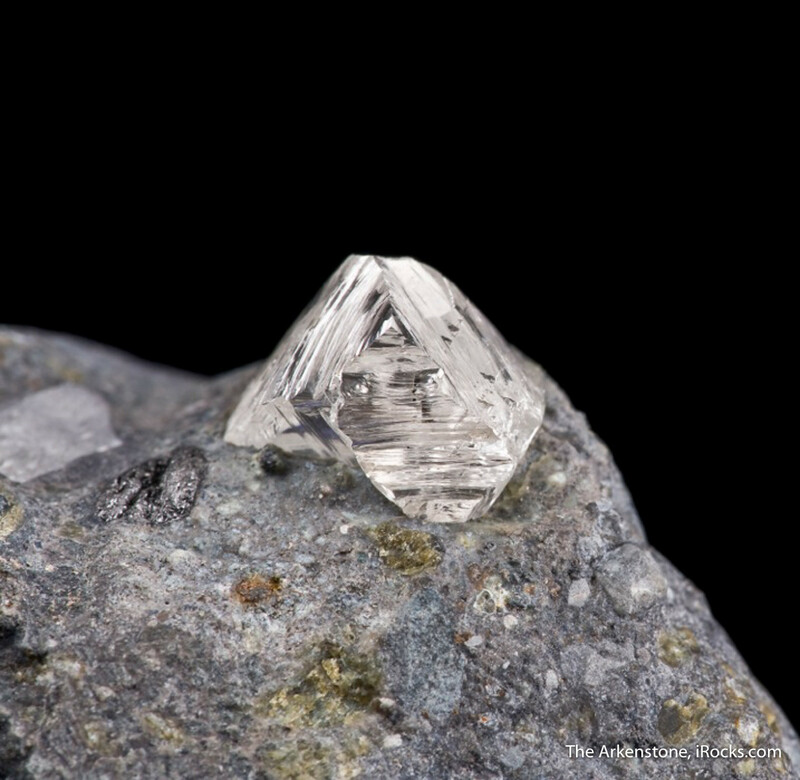 Mineral hardness can be measured on Mohs scale, which applies a value of 1-10, based on the relative hardness of specimens ranging between talc (1), and diamond (10). To determine the value of your specimen, you can compare its hardness to household items of known value, via a simple scratch test. Relative density of an object is equivalent to mass divided by volume. A simple way to determine the specific gravity of a mineral is to divide its mass by that of an equivalent volume of water. If this is not possible, check the “heft” of your specimen – if it seems heavier or lighter than expected when you lift it, this can provide clues which assist in identification. A strong household magnet can be used to identify magnetic specimens, such as magnetite and pyrrhotite. A compass may be used to identify large iron-bearing masses – one may simply observe what (if any) effect they hold on the needle's orientation. Some minerals, such as calcite, react when exposed to acids. If you suspect the presence of calcite, applying a bit of vinegar to your specimen can help you confirm or deny your assessment – fizzing will indicate a positive presence. Fluorescence (or photoluminescence) can be determined by exposing your specimen to UV rays. This means fluorescent specimens will “glow” brightly under a black light. 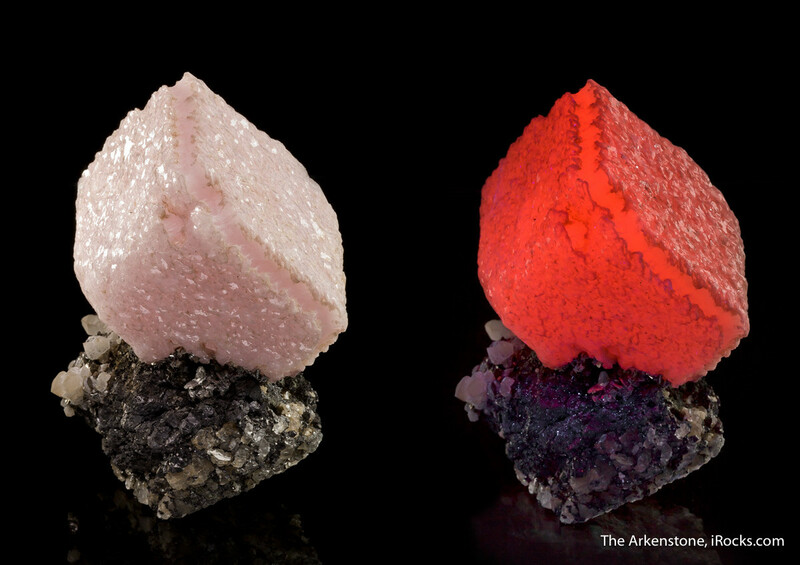 This calcite crystal (left) is shown on the right in fluorescence under UV lighting. From the Robert Lavinsky Collection of Fine Chinese Minerals. Using your normal senses of observation (touch, taste, and smell) can help you quickly identify certain minerals. For example, the mineral halite (salt) can be determined by tasting your specimen, whereas pyrite, sphalerite, and chalcopyrite will all have a distinctive “rotten egg” scent. Graphite may feel cold and smooth, whereas talc and serpentine may feel soapy. By noting these qualities, you may find you can easily separate one distinct specimen from another. Remember – keen observation and an attention to detail are the most important elements to consider when learning to identify your specimens. With a little practice, you'll familiarize yourself with the qualities which differentiate one species from the next – and help you gain the knowledge you need to become an expert collector!